St Croix weather is some of the best in the Caribbean islands. The latest weather in St Croix is shown below. Because St. Croix is a tropical island the average temperature all year round is 82°F (27.8°C). The average high temperature in St Croix weather is 86°F (30°C). Still, the island is not as humid as Miami and frequent droughts are a major problem. Those coconut palms you see have to be watered as they would die out due to the long dry spells that occur frequently in the Caribbean. 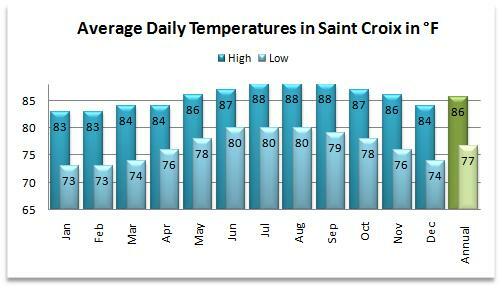 It rarely rains in St Croix (only 60 days of rain all year long); therefore, you can expect that the weather in St Croix is warm and sunny all year round. St Croix is part of the United States Virgin Islands. This island is one of many Caribbean islands that were created by volcanic activity. In the higher elevations of the island temperatures are not as hot as the coast; however, the air is much more humid the higher you go on the island. Still, though there are differences in temperature as you change elevations, St Croix does not experience any significant seasonal changes. It is like a long hot summer that is bright and sunny everyday. The pleasant sea breezes at night, which cool the air to comfortable 77°F (25°C) on average, make St Croix a hit with tourists. People traveling from all over the world enjoys the warm sunny beach during the day and receives a reprieve from the nice cool breezes at night. The only major speed bump with the weather on this Caribbean island occurs during hurricane season where it can get both windy and rainy as huge tropical storms blow by. Hurricane season is from June 1st to November 30th and during this period the weather can get down right ugly. While many houses near the sea shore can flood during hurricane season, as tidal surge and coastal flooding are problems. This Caribbean island is brushed or hit every 3.3 years or so, and directly encounters a hurricane every 13.5 years on average. With minimal rain, and little seasonal variation, St Croix weather is a sun worshipers dream come true.